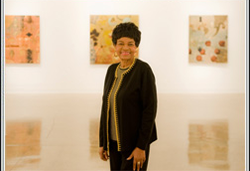 When Regenia A. Perry, Ph.D., professor emerita of art history at Virginia Commonwealth University, earned a Ph.D. in art history from the University of Pennsylvania in 1965, she became the first African-American woman to hold a doctorate in art history and the first African-American to hold a doctorate in American art. Today, Perry feels strongly about giving back to VCU. She created a scholarship in the School of the Arts and has included VCU in her will. The daughter of a poor tobacco farmer, Perry was born and raised in Virgilina, Virginia, and had to fight her way to the top. "I have made sacrifices," she said. "It's not luck. It's hard work." As she made a name for herself in the world of African-American folk art, Perry also embarked on a successful career in academia. For 25 years, Perry taught art history at VCU. She reflects fondly on her years spent teaching in VCU's School of the Arts. In 2000, Perry established the Regenia A. Perry Merit Scholarship. "I feel benevolently toward scholarships because every year of my education - undergraduate and graduate - was financed by scholarships and fellowships. ... It would be remiss if I didn't reach back and try to help someone else the way I was assisted," Perry said. In addition, Perry has included the university in her will. Upon her death, her bequest will establish a scholarship in the Department of Art History. VCU was her only choice as a bequest beneficiary, Perry said, explaining, "That's where I spent the majority of my career - I wouldn't think of another place." Planned gifts are vital to maintaining a high-caliber educational experience while creating a lasting legacy for the donor.